Cristina R Harnsberger, MD, Tianzan Zhou, BA, David C Chang, PhD, MPH, MBA, Ryan C Broderick, MD, Hans F Fuchs, MD, Garth R Jacobsen, MD, Santiago Horgan, MD, Bryan J Sandler, MD. University Of California, San Diego. INTRODUCTION – Current literature on redo antireflux surgery has limitations due to small sample size or single center experiences. This study aims to evaluate the reoperation rate of uncomplicated laparoscopic Nissen fundoplication in a large population database. METHODS AND PROCEDURES – A longitudinal version of the California Office of Statewide Health Planning and Development (OSHPD) database from 1995 to 2010 was used. This database includes all patients from every civilian hospital in California during this time period. Inclusion criteria were patients who received a laparoscopic Nissen fundoplication for uncomplicated GERD or hiatal hernia (types I-IV). Patients were excluded if they had complications of GERD, esophageal or gastric cancer, prior esophageal or gastric surgery, vagotomy, esophageal dysmotility, and diaphragmatic hernia with gangrene or obstruction. The outcome was reoperation, specified as another Nissen fundoplication or reversal (ICD 9 codes 44.66, 44.67, and 44.69). Censoring events included esophageal or gastric cancer and any other esophageal or gastric surgery. Analysis was carried out via a Kaplan-Meier plot, hazard curve, and multivariate analysis adjusting for age, race, gender, comorbidities, insurance status, hospital teaching status, and year of procedure. RESULTS – 13,050 patients were included in the study. The five and ten-year cumulative reoperation rates were 5.2% (95%CI: 4.8-5.7%) and 6.9% (95%CI: 6.1-7.9%), respectively. Of these reoperations, 30.1% were performed at a different hospital from that of the initial fundoplication. Reoperation rate was highest at 1 year post-operatively (1.7% per year), and steadily declined until 4 years post-operatively, after which it remained at approximately 0.5% per year. Multivariate analysis demonstrated significantly higher rates of reoperation among younger patients (HR=3.56, 95%CI: 2.29-5.57 for <30yo; HR=1.89, 95%CI: 1.25-2.87 for 30-50yo; HR=1.65, 95%CI: 1.11-2.46 for 50-65yo) and female patients (HR=1.35, 95%CI: 1.12-1.63). 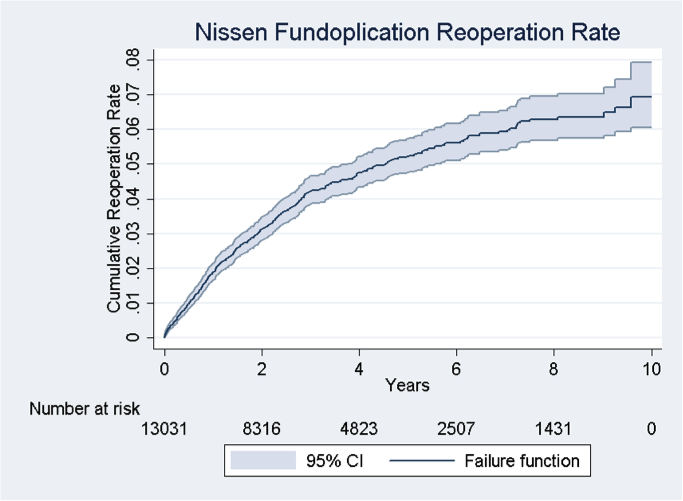 CONCLUSION(S) – Nearly one third of reoperations after failed Nissen fundoplication occur at a hospital different from the initial operation, which raises concern that existing literature does not reflect the true reoperation rate. The reoperation rate is highest in the first year postoperatively. The reasons for the higher rate of reoperation in females and younger patients remain unclear, and warrant further study.